Milta Ortiz is a Bay Area playwright currently residing in Tucson, with an MFA from Northwestern University’s Writing for the Screen and Stage program and a Creative Writing BA from San Francisco State University. Recently, Milta collaborated with Rising Youth Theater to write Disengaged, which premiered at Phoenix Center for the Arts in December ‘2014. 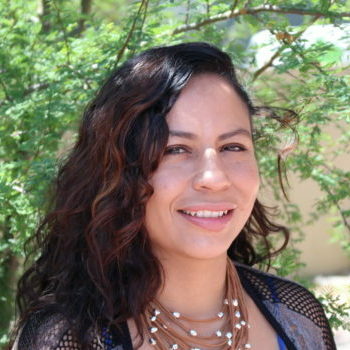 Milta was an NNPN playwright in residence at Borderlands Theater for the 2013/14 season, where she wrote the 18th Annual Tucson Pastorela and wrote and developed Mas, which will premiere at Borderlands in the 2015/16 season. Más is part of the inaugural Latino Theater Commons Carnaval, 2015 play festival. Her play, You, Me and Tuno was a finalist in Downtown Urban Theater Festival 2013 in NYC. Fleeing Blue won the 2012 Wichita State playwriting contest with a university production in November 2012. Last of the Lilac Roses was a runner finalists at NYC’s Repertorio Español, Nuestra’s Voces play contest 2011. She received two City of Oakland Cultural Arts grants and one by the Zellerbach Family Foundation to write and perform her solo work while in the Bay Area. Milta’s day job is Marketing & Outreach Director at Borderlands Theater. She’s worked as a teaching artist for over 6 years and occasionally moonlights as such. She is proud to be mommy to a bubbly toddler.